It is no secret that large areas of India are traditional spiritual and religious strongholds where meeting a vegetarian would be considered the rule rather than the exception, just as it is equally short of revolutionary for Indian vegetarians to adopt a dairy-free vegan lifestyle. Alka Mehta, however, is treading new ground with her range of salt-free, sugar-free, oil-free, cooking-free and milk-product-free recipes. 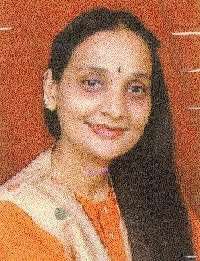 Born a vegetarian, Alka Mehta is the author of several books of natural recipes for adults and children written in her native Gujarati, including Natural Taste, Taste of Living Food, Eat Salads, Reduce Weight, etc. There are also English versions of Make and Relish, her first children's recipe book, and her latest collection, Just Natural, containing 101 no-cook dairy-free recipes. Alka developed a keen interest in natural recipes while experimenting in the kitchen as a child. What finally motivated her to publish her recipes, however, were the positive comments of a doctor friend, writing for a women's magazine, who encouraged her to publish her recipes and books after sampling one of her tempting salads. As a student, Alka had tried to follow the family tradition and studied law to become a criminal lawyer while also taking a course on Montessori teaching for pre-school children. However, she subsequently found working with children more rewarding than with criminals and decided to drop her law practice and start her own nursery. Following Henry David Thoreau's vital message to humanity to "Simplify! ", Alka has put together hundreds of delicious, easy to prepare eats and drinks for the under-tens and their parents and indeed for everyone else to enjoy, avoiding the complicated and time-consuming high fat dishes that are such an unnecessary health risk.